Are you searching for where to enjoy a game of golf while in Uganda, or Kenya, or Rwanda or any other country in East African? Our Golfing safaris plus tours are tailor-made to offer you pleasure of site seeing as well as any additional safari preparations with golf sessions within Uganda, or Rwanda or any East African country. Our staff members evaluate new circuits and actually update them monthly for your personal and utmost enjoyment as long as you make reservations with us. In Uganda, Every District has a golf Club that enables you to play Golf while on your Safari. In your safari in Uganda is to Lake Mburo, we will transfer you to the spectacular Mbarara Golf Club as well as the Boma Ground to enjoy a Golfing game with some of the finest golfers in East African. Must you opt to visit Queen Elizabeth; You will enjoy golf games in the town of Kasese town. A golf course is yet to be constructed In Murchison Falls National Park to offer the guests an opportunity to play while in this verdant wild. 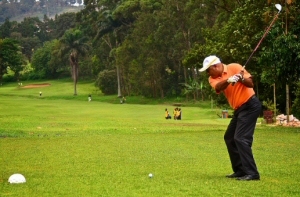 Entebbe Golf Course is situated in Entebbe town just 40 kilometers from the Capital City – Kampala. The course is used for golf all through the year. our Golf tours, will offer you enough time to relax within the beautiful Entebbe Botanical Gardens, tour the Mabamba Swamp to see a number of uncommon water bird species, or even visit the Ngamba Island a Chimpanzee Sanctuary situated in Lake Victoria, the largest fresh water lake in the whole of Africa which offers great opportunities for picnics, sports swimming as well as sports fishing. You can in addition visit the Uganda Wildlife Education Center which is home to various caged animals. Some of the facilities available include Lawn tennis, 18th hole cricket at kakeeka oval and a beautiful golf course for golf, darts and snooker. 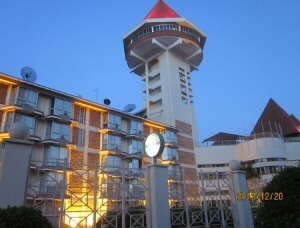 Situated along Kitante Road in Kampala. This course, along Kitante road is widely considered as the best course in the whole of Uganda and at the present time, it is! 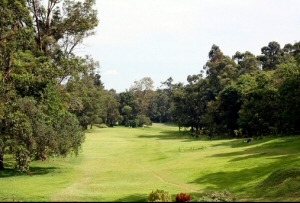 In 2008 during the month of August it hosted the Inter-regional tournament so mean that the course is in a well maintained shape. A lot of efforts have been put in to ensure that the course as well as the Club House facilities are keep to acceptable standards. The greens are wide spread, the tee-boxes are all well shaved, the bunkers raked, and the grass mowed to a evenhanded level, (they are castigatory normally) and as well the additional serves here too have been improved. for instance The showers, are the finest you will ever find in the whole of Uganda all well supplied with hot water, monogrammed towels as well as seats on which you can rest on. Enjoy golfing while on a safari in Kenya or on a beach vacation at the beautiful golf course which is among the best courses in the whole of Africa. The 18-hole championship golf course, which also shelters the Diani Beach Masters, is acknowledged as one among the most exhilarating Golf courses in the whole of Kenya. Entirely irrigated fairways trail through the cashew nut, casuarinas pine and palm trees. The same leveled 72, 6084 m course comprises of 85 bunkers plus a large lake that guarantees challenge as well as excitement for your golf game. There are various bird species as well as monkeys staying within this golf course. The Leisure Lodge Golf Club hosted the Zone 6 African Golf Championship which saw several Teams from 10 African countries participate in this high-status event. * Golf Club houses that offer changing facilities plus showers. Lockers as well as Towels are provided. * In-house snack bar that serves meals through the day. * Satellite TV plus pool table. * Driving range, putting green, chipping green and practice bunker. * well stocked Golf Pro Shop. * Golf lessons taught in English, Italian as well as German. * All equipment readily available for hire. * Male plus female cadies at your service. * Playing plus lesson packages. * Male golfers having a handicap – of – 28, or a playing certificate from an recognized Golf club within Kenya or other country. * Female golfers having a handicap – of – 36, or playing certificate from an accepted Golf club within Kenya or other country. * Suitable golf dressing: shorts / pants for men, and for women skirts of rational length, collared golf-shirts, plus golf / sports shoes.